That’s not even the funniest part! The back side says ロープの外側に戻れ! Sign says: ‘Danger – do not enter within these limits’. Photo courtesy of Keith Bower. Yeah! It’s so true! I did that once and the swelling took weeks to settle down. I’m telling you, there’s no way you could do that if it were purple. If you can understand it’s a notice, you pass! 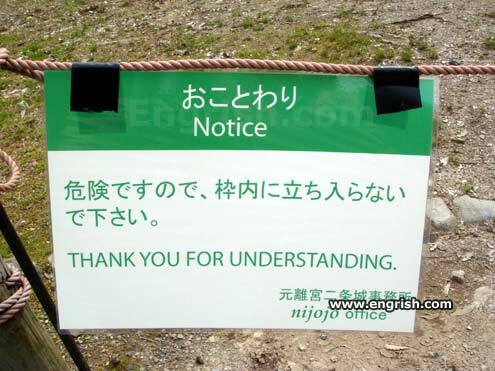 Oh, yeah, I understand! Green means go, it is international. Notice: confusing tourists is fun! I think the nijojo office is a bit xenophobic is you ask me, trying to put foreigners’ lives in danger like that. @ coffeebot: Iye. Do itashimashte. From the folks who brought you “You Are Here” markers. Well that was certainly Lost in Translation. Welcome to My Life In Japan! This is really smart way of putting notices on signs. Simply: the back side notice explains everything! “Okee Opie dess neh” I never got a chance to use it. Now, don’t make me say this again!!! No really, the message soaks in after you stare at it for a few hours. A rope is a universal signal for stay the hell out! I don’t get it? what did I understand? The sign just wants you to notice it. Not all’s lost though. Anyone who can read Chinese will figure out bt the first 2 words its mildly dangerous, which makes you want to cross that line even more, doesn’t it? Vice versa; the locals can’t understand the English part also, no? When they read the sign it just tells them to stay out without any apology, which from what I know goes contrary to their culture. Those reading in Japanese shall not be thanked for their understanding.